When Jason and Daresa Sofey purchased the former W.S. Dorset family estate on Sherman’s North Preston Drive, they were committed to bringing the 1939 residence back to its former glory, and then some, but the project would have to be a rehabilitation, rather than a restoration. The distinction allowed the Sofeys to adapt the historical home registered by the Sherman Preservation League for a compatible, contemporary use, while protecting its heritage value. In the 1960s, not long after W.S. Dorset’s death, his wife Bonner and daughter Carolyn Dorset Fields sold the large house at 1218 N. Preston Drive to Charles Robinson, a local attorney. 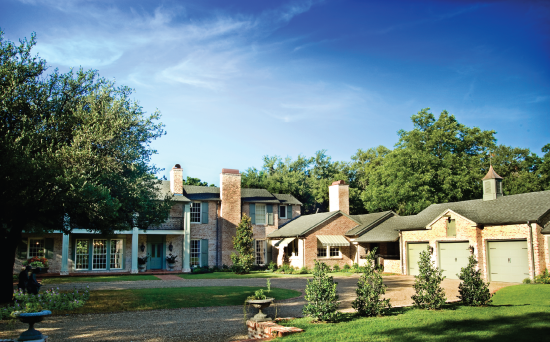 The Robinson family lived in the house until a few years ago, when he sold the property to a Dallas businessman. The house was vacant until the Sofeys bought it. It took the couple two years of juggling full-time jobs with working on the rehab project to finish the house. Jason Sofey is a fourth generation Shermanite, and rehabbing houses is in his DNA. His parents bought and sold real estate and were remodeling homes and “flipping” them long before the term had been coined. “I remember going out on projects with my mom and dad and cleaning up and fixing up houses as early as age ten,” Jason Sofey recalled. Going into the project, Sofey knew that new electrical wiring and heating and air conditioning were necessary, but the “bones” of the house were in extraordinarily good condition. “Honestly, the structural elements are more substantial than in most new houses,” he said, adding that all the original windows were usable and preserved. The original layout has remained as designed, with the exception of the bathrooms and kitchen. “Houses of that period just don’t offer the kind of expanded bathrooms and kitchen areas that are conducive to modern family life,” Sofey said. Walls from the breakfast room and butler’s pantry cut up the kitchen, which was the only room in the house with eight-foot ceilings. The Sofeys gutted all five bathrooms. The new master bath features a six-foot pedestal tub that overlooks the back yard and a nine-foot shower of travertine tile with dual water jets. Throughout the house, the original cabinets and hardware were restored, wherever possible, and supplemented by period reproductions. 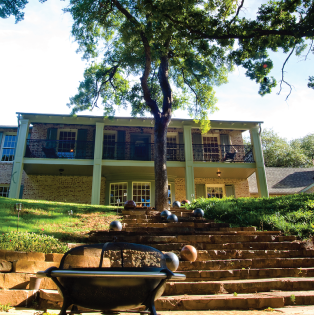 The large living areas, the library and family game room, still have floors of original quartersawn, scraped oak planks, some up to seven-inches wide. The Sofeys invited Carolyn Fields, who still lives in Sherman, to tour her childhood home during the early stages of the remodel. “Carolyn told me her father had a poker table and a pool table in the family room,” said Sofey, “so I decided to furnish the room much the same way.” Well, almost. The Sofeys added two 50-inch plasma televisions. The entire house has a multi-channel sound system, with the electronics hidden in a cabinet beneath a built-in wine rack. A huge stone fireplace provides the focal point of the room. Off the family room, in the south wing of the residence, a screened-in porch has a small anteroom with a wet bar, refrigerator and icemaker. Jason Sofey’s mother, Missy Sofey-Andrews, a well-known artist, brought her special talents to the project, as well. “My mother painted landscape scenes on the panels near the windows to give the family room a period look,” Jason Sofey said. Sofey-Andrews also hand painted the walls of the master bath and the powder room off the foyer. The restoration unearthed some happy surprises, in one case literally. The Sofeys found stone paths, buried under layers of dirt, running over much of the property. These walkways were uncovered and restored. Investigating the home’s foundation, they discovered that three steel I-beams supported the main floor. They also found and restored a crystal chandelier, which now hangs in the dining room. For all they have done, the Sofeys aren’t finished just yet. Plans include a swimming pool, a covered deck, the conversion of a trash-incinerator fireplace into an outdoor oven, and a landscaping makeover. Like most other great homes, 1218 N. Preston Drive is a work in progress. Jason and Daresa have been reviving houses ever since they were married eighteen years ago. Their first home was a remodel. Daresa is an interior designer and has been working with Mike Goolsby at Roberts Decorator Supply for fourteen years. This month she will expand her services as part of a co-op called Premier Home Designs, located in the new Heritage Crossing retail and office development at Lamberth and Heritage Parkway (FM 1417) in Sherman. One of Jason’s companies, Spavinaw Development, built and owns the center. The new co-op will offer access to experts in home construction, swimming pool design and construction, landscaping, granite and stonework, wood flooring, and other services. Jason currently serves as chair of the City of Sherman Planning and Zoning Committee, and on the City’s Comprehensive Plan Advisory Committee. He serves on the board of AmeriState Bank, the North Texas Youth Connection, and the Tri-County Home Builders Association. Daresa is a past president of the Sherman Symphony Guild and a member of the Sherman Service League. 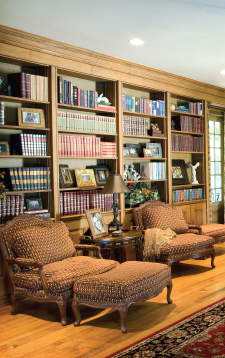 The formal living area is dominated by a custom built-in library wall. Large, overstuffed chairs encourage taking time for an evening of reading.